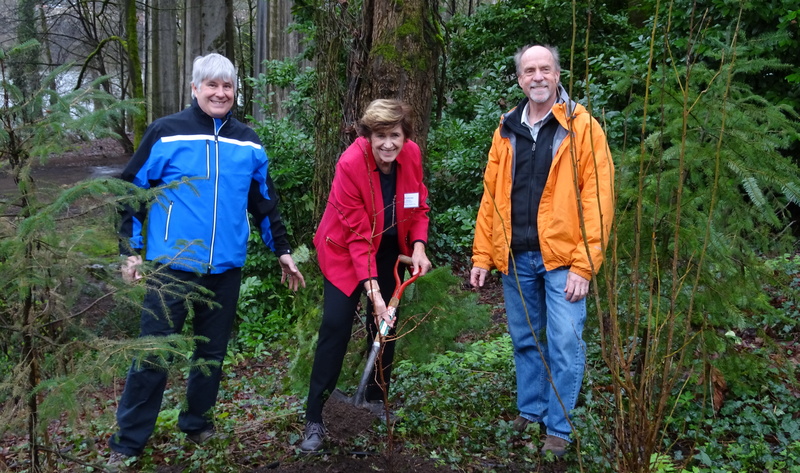 Volunteers from the West Linn Garden Club donated a Dawn Redwood sapling to McLean House. The Dawn Redwood is considered a “living fossil”. It dates from prehistoric times, and was long considered to be extinct, as its only evidence was in fossilized rock. In 1941 a living specimen was discovered in remote China. Its seeds were brought to North America, where it is cultivated and grows successfully. This planting coincides not only with Valentines Day, but with the 35th anniversary of Friends of McLean Park and House, and the 100th anniversary of the West Linn Garden Club. Attending: Friends of McLean Park and House, West Linn Garden Club members and West Linn’s Mayor Russ Axelrod and family.